Is this correct? Learning English is a vehicle to transport you on the highway of career advancement; this is absolutely true for most students who learn from me. You understand that English proficiency is an important component of professional development. However, it is only a beginning. In order to attain higher pinnacles of success and respect in your work, you must become a master of communication. What does this mean? It means that once you have good command of the English language, you must learn to adapt your style of communication for developing strong relationships with all personality types. And, the skills required to do this are not that difficult. Knowing how to recognize different personality types and respond effectively to each one will establish you as a great communicator, someone who connects with both co-workers and superiors, and someone who should be considered for managerial or leadership positions. But wait…there is more. Everyone has a primary modality for accessing and imparting information. Have you noticed that some people are ok with receiving important information by phone call? Or, what about the boss who insists on seeing you in person to discuss an important matter? This is probably because the boss has a primary modality that is visual, while ones who are satisfied with a phone call are primarily auditory. Does knowing this help you to understand communication preferences and develop a stronger relationship with your boss? You know it does! Finally, you must know that conflict is inevitable in human relationships. Knowing how to manage conflict is essential to professional growth. Strategies for containing conflict will vary according to personality types. However,thereare simple responses in the face of conflict that will help defuse almost any situation. You don’t even need to be accent-perfect to become a master of communication in English. Consider Arnold Schwarzenegger, who still has a noticeable accent yet became wildly successful in English speaking roles in movies and as governorof California. Why? Because he mastered the art of communication, the key to leveraging language for career development. A few years ago, a computer-based glitch on the United Airlines website allowed passengers to book flights to Hong Kong — or other places in Asia connecting in Hong Kong — in exchange for a paltry four frequent flier miles, plus government taxes. The advertised actual price of the ticket was accurate; the technical slip-up occurred in the transaction process. United eventually corrected the error and announced it wasn't honoring tickets already sold. People could get a refund without paying a penalty or have the proper amount of miles deducted. Anyone who had already started their trip would be allowed to complete their travel. Several people who booked tickets are complaining to the DOT, which is now investigating the matter. A 62-year-old retired teacher from Aiken, S.C., is one of the people who bought a ticket. She knew it was a computer error but booked a trip anyway. "United just made a big mistake and needs to honor it," she said. "That was their mistake, wasn't it?" The most disturbing aspect of this mindless justification is that it comes from the mouth of someone who was educating our children for a living. If she were given too much change back from one of her students, would she keep it, rationalizing “that was their mistake”? How many other ethically vacuous educators sanction this behavior? I would fire them immediately if the power was mine to do! Let me be clear…I'm no fan of United Airlines. Customer service is atrocious and the temptation to rip them off is almost irresistible...but to take the ticket and run, knowing the advertised price and that the error was computer-generated in the billing is poor integrity, and a microcosm of what's askew in this world. Continuing the ongoing theme from last week of how to sustain our energy levels, we move from the emotional/spiritual component (connecting to purpose) and the physiological (deep breathing) to the mental/interactive: communication. It’s estimated that 80% of all mistakes, miscues, malfunctions in the workplace, call them what you want, are due to sloppy communication. When this issue goes unaddressed and is allowed to fester in the form of unresolved conflict, most everyone’s energy level sags and productivity starts to plummet. Withheld communication, whether in the form of suppressed opinions or feelings, become a concrete albatross to the goals and objectives shared within an organization. Withholds need to be shown in the bright light of safe scrutiny with the intent to resolve. Establishing a culture where this process is given high level support staffed with highly skilled communicators is essential. When people know that issues like miscommunication or personality friction are going to be dealt with fairly and effectively, a sense of trust and confidence pervades. 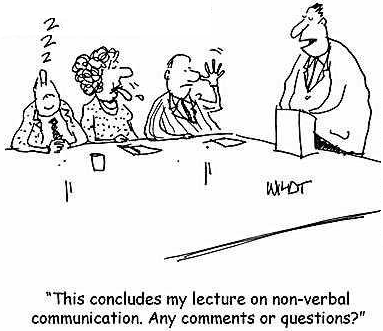 Good communication interventions are a crucial component of sustaining high energy levels in the workplace. In addition to competent communication intervention, employees in all departments should have training in state of the art communication skills. Some executives will dismiss the notion with a “we can’t afford it” objection. They need to realize how much it costs the company when miscommunications lead to enormous reparations. Strategies such as how to recognize different personality types and deal with them when they are under stress will save the company lots of money in the long run. Learning how to adapt one’s communication style to understand others is a flexibility skill, paying dividends in warding off misunderstandings that snowball into stormy fiascos. These are the all-time nominees for the Chevrolet Nova Award. This is given in honor of the General Motors snafu in the ‘70s, trying to market this car in Latin America. "No va" means, "No go," in Spanish. 1. The Dairy Association's huge success with the campaign "Got Milk?" prompted them to expand advertising to Mexico. It was soon brought to their attention the Spanish translation meant, "Are you lactating?" 2. An American T-shirt maker in Miami printed shirts for the Spanish market that promoted the Pope's visit. Instead of "I saw the Pope" (el Papa), the shirts read "I Saw the Potato" (la papa). 3. Pepsi's "Come Alive with the Pepsi Generation" translated into "Pepsi Brings Your Ancestors Back from the Grave" in Chinese. 4. The Coca-Cola name in China was first read as "Kekoukela," meaning "Bite the wax tadpole" or "female horse stuffed with wax", depending on the dialect. Coke then researched 40,000 characters to find a phonetic equivalent "kokou kole", meaning "happiness in the mouth." 5. Frank Perdue's chicken slogan, "It takes a strong man to make a tender chicken" was translated into Spanish as "it takes an aroused man to make a chicken affectionate." 6. When American Airlines wanted to advertise its new leather first class seats in the Mexican market, it translated its "Fly in Leather" campaign literally, which meant "Fly Naked" (vuela en cuero) in Spanish!